Professionals who are involved in developing an organization’s operational efficacy and improving the performance of their company will have to resort to their business analytics skills. Predictive Business Analytics is helpful to understand business functions better and will also help professionals to get solutions for issues that a company is facing. 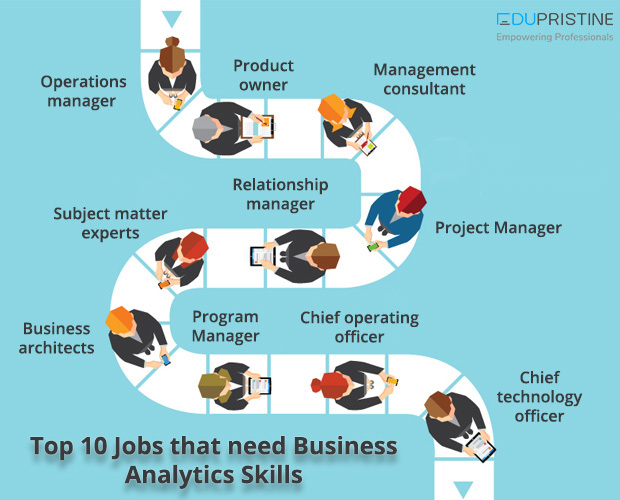 Read on to find out about those top 10 jobs that need high business analytics skills. The primary function of an Operation Manager is to make sure that the company runs smoothly. In addition, he has to scrutinize the existing process, identify problem areas and find solutions for the same. He is also responsible for marketing financial plans. A Senior Manager of Operations Marketing has to fulfill the duties of managing financial plans. However, he must ensure extraction of information from databases for helping in creating better marketing campaigns. To get appropriate solutions, Operations Manager has to get data from reports and databases. For this, he will surely need business analytics skills. Product owner needs to know the company’s business goals. He has to make sure that the product will help in achieving these business goals. The person has to analyze the competitor’s products and develop business strategies after taking into consideration the different business goals. Backlog refinement and escalation of the issue to the concerned person. Obviously, they have to make use of market data and business statistics in order to make the correct decisions. The PO creates a clear picture for better decision making by studying the demographics, market data’s, statistics of usage, distribution of resources, therefore, helping out in achieving business goals. With the use of data, they have to determine the exact issues faced by company. They have to take care of the stakeholders and business requirements. Similarly, they have to analyze data and determine those areas where there is scope for improvement. Thus, a smart consultant does not have only smart ideas but also the ability to convert these ideas into action, which can only be done through analytics. A Project Manager must have the ability to identify the exact turnaround time needed for every stage of the production cycle. Product positioning, strategy formations for cost reduction and risk management are some of the things that a project manager has to handle. However, a good product manager will make use of data to form profitable product decisions. He needs to take corrective measures and must have the ability to implement solutions as soon as an issue arises. For this purpose, he must be well versed in the planning of analytics execution as and when needed. Relationship manager has an important role in any business. He has to help clients with different technical and business issues that they may be facing. He also needs to keep a tap on competitor activities which may be a potential threat or loss for a client. Also, he must also have the ability of product customization depending on customer needs. Also, must be able to develop strategies for acquiring new clients and retaining existing clients. Hence, all this can be fixed with proper predictive analytics. His focus will only be on his domain. They have to make use of their technical expertise and analytical skills to solve difficult problems in their domain. But they may not have a broader perspective of the company, due to which they may find it difficult to contribute to finding solutions to different complex issues that the company may face. It is therefore important that these people develop their analytical skills which will help them get a multi-faceted approach. As the name suggests he will have to develop the entire structure of the business. By taking into account the different components of the system he has to bring about improvement in all business operations. However, he has to take into account all the details about the organization in order to develop good strategies. Also, the role involves using the best analytics lifecycle for streamlining the business as a whole. The manager has to make sure that projects are delivered on time. His main function is to guide the team throughout the process. Which are an integral part of the working of any environment. For all this, he will obviously need very good analytical skills. Role of a Chief operating officer is to play an all-important role of implementation of business operations. However, he needs to have strong analytical skills and very good leadership qualities. Also, he must know how to use big data to the advantage of a company. COO’s have to build analytical models, and for this, they need to have good knowledge about analytics. Chief technology officer has to analyze all technical aspects of business and will be responsible for the development of the company. For this, they have to go through a number of factors and analyze lots of data. As you can see all these jobs involve analysis of a large amount of data. Undoubtedly, professionals need to have competent business analytics skills. One needs to ensure that they opt for a good Business Analytics Course which will help in sharpening the business analytics skills of the person. EduPristine Predictive Business Analytics Program is an intensive, 100+ hours program curated by Industry experts for high-performing individuals who wish to master the tools of predictive analytics and give a boost to their careers. In addition, Get practical and experiential learning, along with soft skills and 100% placement assistance. Hence, students can expect a mix of case studies, analytical tools, and the hallmark pedagogy of learning through a plethora of hands-on and real-life scenarios. Finishing the course with our state-of-the-art Capstone project helps the participants to season their skills as a Business Analytics professional; thus, making them ready for the job role. Thus, the methodology offers real-life challenges, compelling learners to apply concepts in the class and prepare for career realities.